In this case I chose to juxtapose them, rather than integrate them. As with the former image, the impasto side references the more painterly side of 20th century figurative art, most notably Francis Bacon and Frank Auerbach. That would be rather obvious to people who know their modern art, but also immediately separates these selfies from millions of others that are blissfully unaware of art history, and just aspire to being Facebook fodder. There are many more reasons they are different, but this makes it instantly apparent. There’s also something to do with pairing two different styles in the same image. It goes against a certain grain of artists being required to work in only one style, their signature style, so that it can be easily branded and marketed as a commodity. This works fine for many artists, but I’m more in the camp with people like Picasso, Max Ernst, David Hockney, and many others (both famous and unknown) who like to experiment with multiple approaches, synthesize the results, and create hybrids. Not only are there 2 styles within one piece, there are multiple styles in this series. In fact, it’s very difficult for me to work in a series (which is essential for getting ANY recognition) because I am a relentless experimenter. 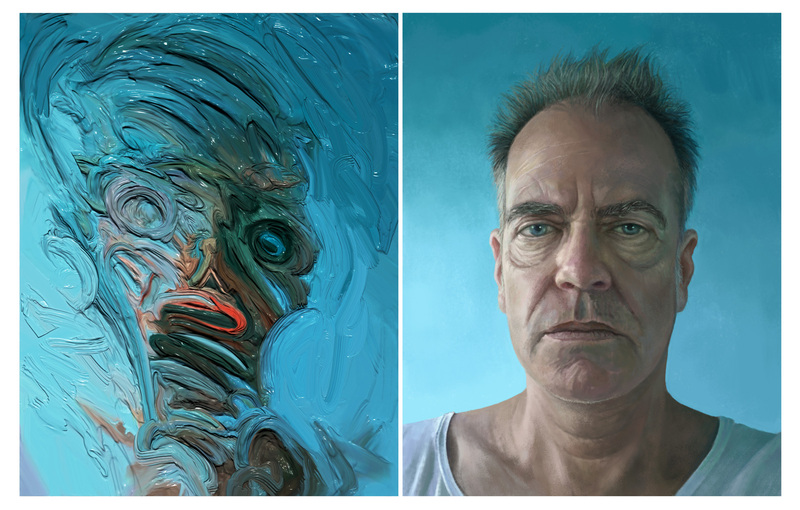 But this series allows me to tie them together around the subject of a self-portrait. In #28 it might seem like the girl is the model and the painting is of her. In this one, one could say the same thing, but it’s somewhat more likely that the representational image is the artist, and the painting his (partly because it’s true-ish more, in that I am closer to the older version of me than a younger female version). Besides that, the two sides show nearly opposite approaches. One is realistic and struggles to achieve fealty to appearance in terms of subtle details of shading and anatomy. The other is all about the medium of paint, and suggests rather than illustrates a visage. As far as I know, nobody else have figured out how to do this sort of vigorous impasto painting digitally. Even if I were to share my specific technique, you still need a painting background and appreciation of this kind of art to do it. No, the machine doesn’t do it for you. 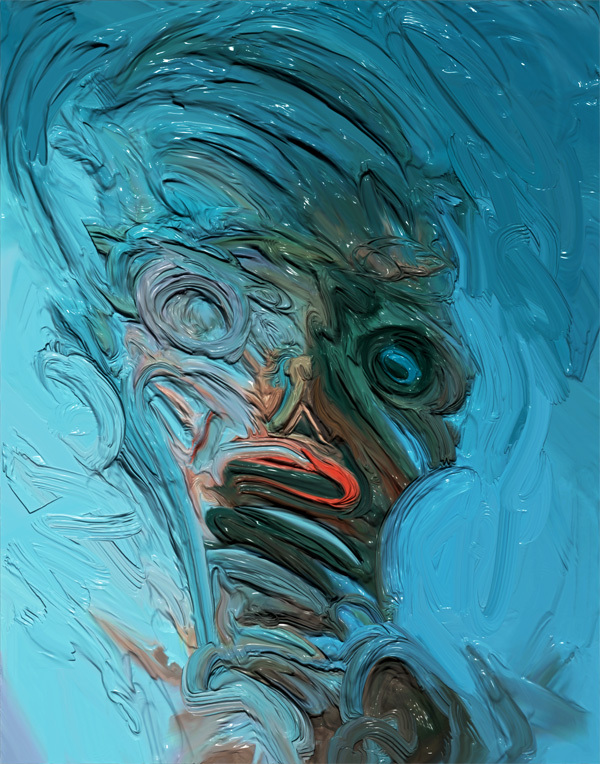 Also as far as I know, nobody has explored digital impasto as much as I have, and this is just one of my techniques. I like the light, airy, crisp quality of the realistic image. The gradient of the sky-blue background works well, and matches his eyes, He could be indoors or outdoors. He’s got a calm sort of dignity about him, despite looking a bit haggard and perhaps poor (he’s just wearing a T-shirt). Likely he’s the “starving” variety of artist, which is also a bit too close for comfort. The left side has a frenetic energy and really gets into the blue-greens, especially in the thicker paint at the top. I intended this as a complement to the last piece, and I think it does that well. I’ll probably do some more diptychs, painterly or otherwise, but I’m planning something a little different that you haven’t seen me do yet for my next one. And another note on using the self-portrait. A superficial reaction would be that it’s restrictive and closed because it only applies to one person, and is only about one person. I think I’ve blown the walls out on that one by creating all the different people and NEVER including myself as I am. 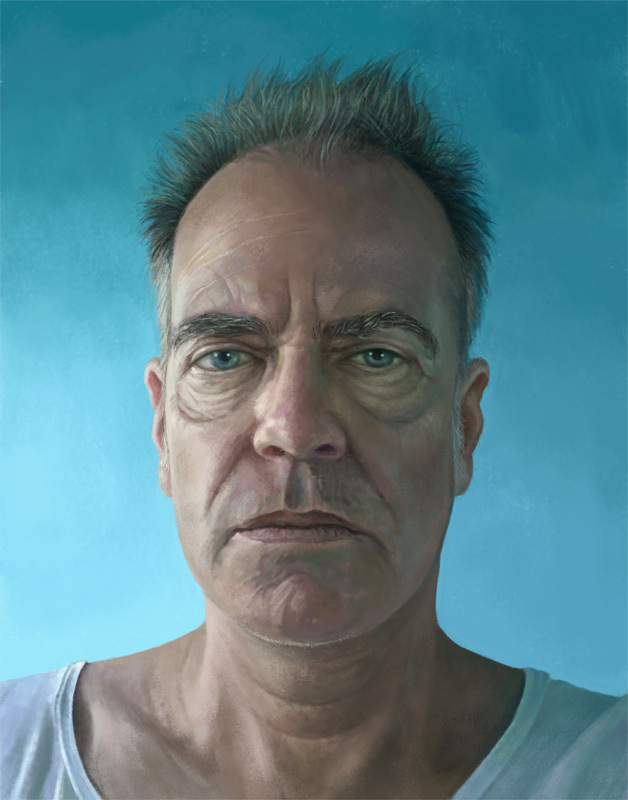 But beyond that, self-portraiture addresses the individual and the relation to oneself, and everyone is an individual. Thus, while seemingly an isolated subject, it is really an inescapably universal one, especially if the subject keeps shifting into different lives and circumstances. One could see this series as a psychological and philosophical investigation of identity and existence, rendered in a new medium and incorporating stylistic and technical innovations to do so. Or one could dismiss it out of hand as shallow narcissism and just pushing a button on a machine. So far the latter perspective prevails. Posted in art, Selfies From Alternate Universes, UncategorizedTagged art, contemporary art, digital art, digital painting, Expressionism, painting, portraitBookmark the permalink. Fabulous Eric! I have been enjoying your blog and art so much more receiving your updates. Much more in depth and easier to view than on Instagram on a tiny phone screen. Thanks, Amy. Yeah, I see my blog as my real venue. For one, it’s MINE. I’m not just a participant among scores of millions, but it’s my own space. I think I may have one of the most comprehensive artist’s blogs out there. At least I haven’t seen another one as encyclopedic. If I’m ever discovered or able to cobble together the remotest semblance of a “career” (ex., able to merely survive off my art, while living dirt cheap in the developing world), there will be a treasure trove of material by and about me and my art (as well as lots of other art-related subjects) for anyone interested. OK, now I’m sounding a bit like a legend in my own lunch-box, but, I suppose it’s a counter to absolute indifference from both the art world and the art audience. Did you send the print? I’m moving to a new apartment in December and looking forward to hanging your print! The blues are quite nice. I like the goopy side, too! The suggestion element is there, but not too much there, if that makes sense. Yup, it makes sense. It’s as if a paint-man is coming into being. There’s an element of how little is necessary to convey a personage, and thus an entity, or a consciousness. 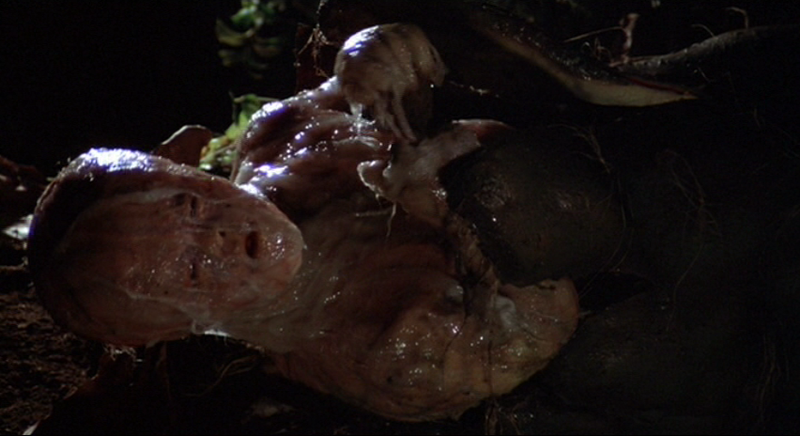 Speaking of ‘coming into being’ the left one reminds me of the half-formed clones in Invasion of the Body Snatchers (1978 version). I’m with Amy on this one. When I saw the realistic portrait on IG it didn’t strike me as much as it did here, in the large format. It’s wonderfully done. I feel so calm looking at it. And then, looking at the impasto, I kind of want to get my hands dirty. Love the energy! Yes! The impasto rendering blows me away. It’s a great complement to the realistic version. I keep meaning to ask you if you print your pictures on occasion (or routinely). I have only ever printed out 1 piece, and it was over a decade ago. It came out spectacular. A few others have been printed by others, but I never saw them in person. They said they looked great. It’s one of the sort of tragicomic ironies of r my art career thus far that I never get to see my own work printed. It is somewhat sad that you don’t see more hard copy versions of your works. I would imagine it would take a high-powered printer to do them justice, and to produce a larger-than-standard size on good stock. I think such machines exist, but I haven’t seen one. Prints are actually easy to do, and there are plenty of places to do them. There are even lots of online services. It’s just a question of money and motive. I didn’t realize that. It’s good to know those resources exist.